It's four years after the events of Penric's Demon, and Penric is fully trained and invested as a divine; he's now Learned Penric. And of course, a sorcerer. He's serving at the court of the Princess-Archdivine. He is continuing his mostly scholarly work, as he and Desdemona become better acquainted and better at working together, when a Locator of the Father's Order arrives seeking assistance. He's been assigned to seek and bring back to Easthome a shaman accused of murder. A killer shaman is dangerous; he can't pursue one without a sorcerer and at least a small armed troop. Unfortunately, Oswyl has had a difference of opinion with the sorcerer and troop originally assigned to assist him. They've gone off in pursuit in a direction he thinks unlikely on the evidence, and he's asking the Princess-Archdivine to supply the sorcerer and troop he needs. She does, and the sorcerer, of course, is Penric. The rather dour Oswyl is not initially impressed by Penric's youth and seeming inexperience, or by his cheerful, sunny manner. Despite this, they work fairly well together, tracking the shaman, Inglis kin Wolfcliff, accused of the murder of his best friend. 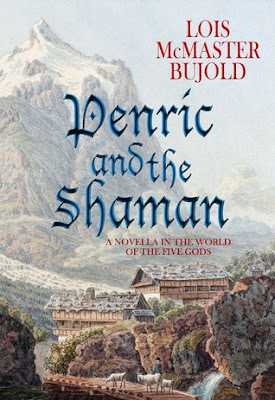 When they find him, of course, the situation is more complicated than official reports have suggested, and Inglis needs Penric's help, while the Acolyte serving the village where he's found needs Inglish's help. Penric, Oswyl, and Inglis all have a lot to learn, and very little time to learn it in. The story is told alternately from the viewpoints of Penric, Oswyl, and Inglis. The World of the Five Gods remains a fascinating and enjoyable one, and I look forward to more stories set there.